World War I Signal Corps operators did not have an easy job at the front. 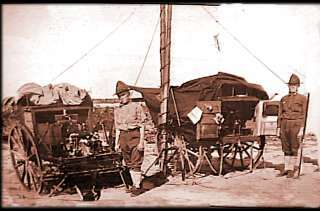 Each location required the unpacking of equipment from several wagons followed by the erection of antenna masts and the managing of large generators required to power the spark transmitters. It took years for Marconi to convince the various arms of the military that Wireless would benefit warfare. Prior to wireless, the only communications from the front was by wire telephone and from the air the only solution was hot air balloons tethered with a telephone line to report enemy locations. 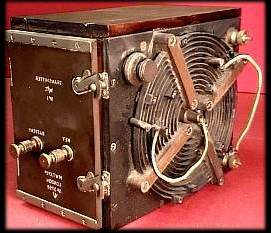 This QRP Marconi Spark transmitter was used by the Royal Air force recognizance aircraft During World War I. Equipped only with a one of these transmitters (no receiver) the radio operator would transmit the location of the enemy in Morse Code and assist the gunnery officers site in enemy targets. This HRO receiver look-a-like was captured by the Americans from the Japanese during the Second World War when the US retook the Aleutian Islands off Alaska. The dial mechanism is the first giveaway to the radios origin. 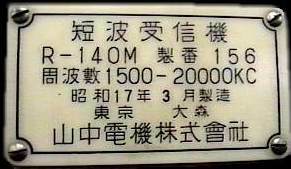 The US Navy sent the radio to the National Corporation for examination. After extensive testing, National reported the receiver met the same specifications of their original HRO. We believes this Japanese model is the last surviving operational unit. The BC375 was a versatile transmitter developed in the late '30s and saw service in the B17, B24, B25 and B26 bombers. This BC375-E Serial Number 60946 was made by General Electric. 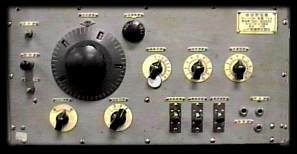 The frequency range was 150 kHz to 21000 kHz using various Tuning Units. This transmitter and matching TU8 tuning unit covered 6200-7200 kHz. Using three 211 tubes in the final the BC375-E produced 840 watts of DC input on AM and 600 watts on CW. It was also capable of MCW operation. 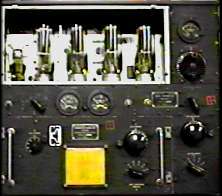 The companion receiver to the BC375 was the BC348. 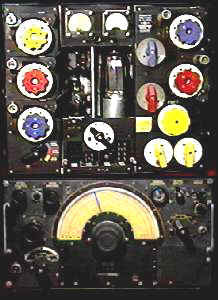 The AR1154 transmitter (top unit with multi colour knobs) and the AR1155 receiver (bottom unit) were used during W.W.II in the British built Lancaster bomber. The AR1155 receiver was popular amongst Radio Amateurs after the war many of which still survive today. However the AR1154 transmitter was not a popular unit being used mainly for parts. This has resulted in complete AR1154's being quite rare.